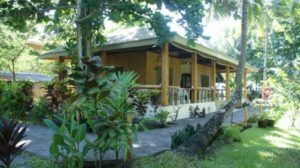 Last night the earth shook in Bohol. 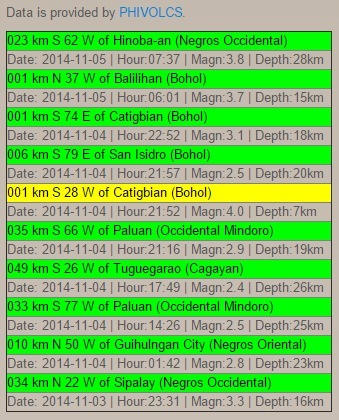 One 4.0 Earthquake in Catigbian and 3 aftershocks. Around 10 p.m. we got a message from a friend living in the vicinity: Wow… that was a strong earthquake. Above information is a screen copy of our Earthquake page. 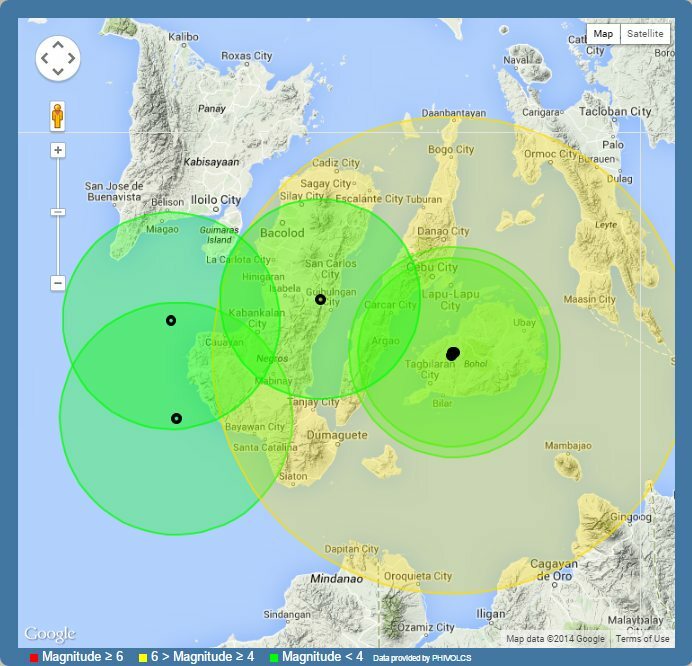 the respective centers of the 4 earthquakes are near to each other. in above image they are one dark spot. You may want to zoom in our map and see the distinct centers. The focus depts of the 4 quakes were between 7 and 20 kilometers. Intensity V is Strong. It is generally felt by most people indoors and outdoors. Many sleeping people are awakened. Some are frightened, some run outdoors. Strong shaking and rocking felt throughout building. Hanging objects swing violently. Dining utensils clatter and clink; some may be damaged. Small, light and unstable objects may fall or overturn. Liquids spill from open containers. Standing vehicles rock noticeably. Shaking of leaves and twigs of trees are noticeable.